Hi, please check the image below. 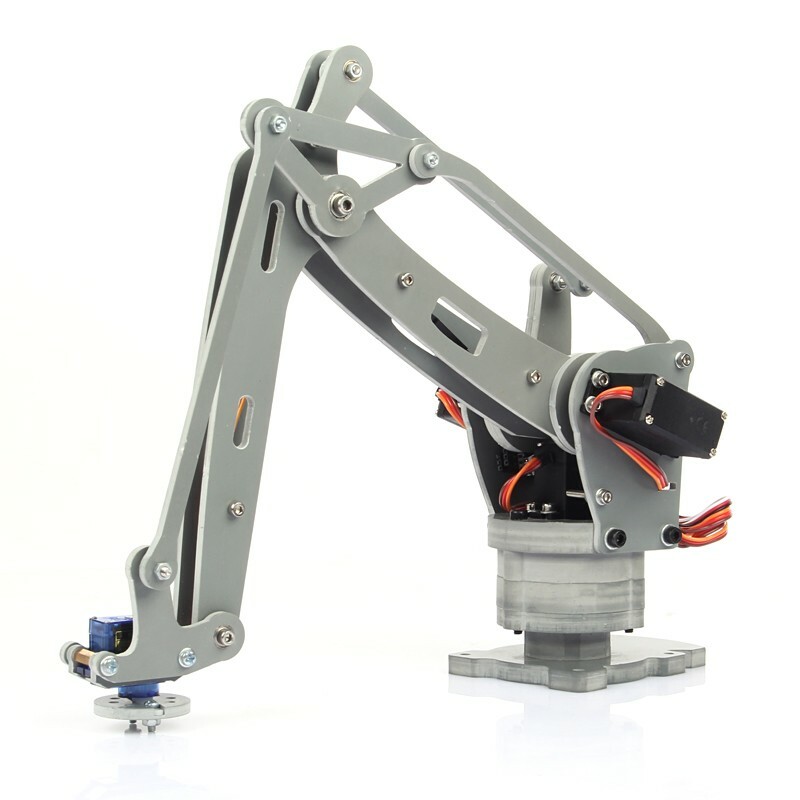 I want to build this robot arm using arduino and I know there ARE THOUSAND projects online about this. BUT NONE, REALLY NONE, talk about how to keep the last bar horizontal without using a servo at that very last bar cause almost all robot arm does not use a servo to keep the last bar horizontal! You see in the image I attached that the green and blue bars are gonna be controlled using 2 servos, spinning the bars in precise angles. My problem is this: what kind of mechanism or bar linkage can I use in order to always keep the last bar (red) horizontal so my pencil will always get vertical? I know I could use a servo in this very last bar (red) and spin it in order to keep the red bar horizontal BUT I saw many 3D robot arm in the internet that uses some kind of mechanism to keep the last bar always horizontal, no matter the angle of the other 2 bars. You can see the last bar is always horizontal and those projects are not using a servo to keep it horizontal. What type of mechanism or bar size of relation or bar linkage rule that I need to follow in order to my keep my last bar horizontal? Why don't you build a linkage like in one of the two pictures you have posted? The important feature is that 2 points on the arm you want to stay horizontal should be fixed to two points on the base. Then the arm will always stay in the same orientation relative to the base. Get some pieces of Lego and experiment. maybe you could use wire attached to the outer edge of the red bar, run it over a pulley at the joint between the green and the blue bar and attach it at the base (grey) again. Or am i thinking wrong? I think this approach (makearm) is WAAAAAY better than most "3d robot arm" projects around cause it has veeery feew linkages and it's so simple to build and the pencil will always be vertical, without any mechanism. Does any of you know any disadvantagem of makearm related to the common 3d robot arm approach (which I provided pictures in the first post)? Thr mechanism is called parallelogram, if you make a paralelogram with four bars and fix one of them, the opposite one keeps parallel while moving any of the adjacents. You can see the mechanism in the second and third photos. @QueMajo that's great parallelogram! I took a look at google and found some videos at youtube but I think it's not exactly what I am looking for... I need to be able to move to arms freely (2 degrees of freedon) and the third arm has to maintain it's orientation no matter the angle of those 2 arms. Study the pictures that you yourself have provided and figure out how they work. Then make your own example using the same principles. If you study the photos you will see that there is a piece at the top hinge point that also retains its orientation as the arms move. And it transfers that fixed orientation to the bar at the end. Like I said earlier if you have Lego you can easily experiment. Or you could make bars from cardboard with thumbtacks for joints. @Robin2 if would nicer if you said "I have no idea how to help, maybe you should wait if another humble person can help you". Instead of saying "you lost your time coming here making this question, go f*** yourself and try to get the answer by yourself cause nobody here knows how to help you". If I go to a forum make a question I hope I can have some help instead of stupid person coming here saying "check your own pictures and find yourself the answer you are looking for". If you had spent a few minutes trying to understand what I said you will see that even a difference of few millimeters in bars sizes will not work so trial and error is a stupid approach. I take great exception to that. I said nothing of the sort. I have never said anything like that to any person on the Fourm. All of my Posts were sincere attempts to help. I am reporting your abusive comment to the Moderator. @batata004 will be spending some time away from the forum.